At a symposium last weekend at the Academy of Sciences, Alana Hysert, Academy Naturalist, reported some interesting preliminary data on the living roof. Recognizing the research and education potential of the new green roof, Hysert has been overseeing a citizen science project, involving 67 volunteers whom she has trained to monitor the plants, insects and birds that are adapting to life up on that aerial garden. Data collected since June 2009 shows increasing diversity in plants, birds and insects with some species beginning to dominate. The most prevalent plant species are the beach strawberry (Fragaria chiloensis), selfheal (Prunella vulgaris), and (surprise!) moss. Nobody knows where the mosses came from, but they appear to be varieties of early-succession mosses, the types that commonly show up in disturbed soil. The project is monitoring plants in four different quadrants of the roof (NE, NW, SE and SW), and another interesting finding is that in two of the quadrants, there are now slightly more non-native species than native species, while in the other two areas the native species still outnumber the non-natives significantly, although non-natives are appearing there as well. The roof was originally planted with only native species, so, as expected, non-native plants have begun to colonize the roof. But why this difference in different areas of the roof? Twenty orders of Arthropods (insects) have been collected on the roof in both surface and pit traps. The most abundant order is the one that includes flies/gnats/mosquitos. Again, there is significant variation between the four areas of the roof that are being monitored. Identifying insects is a time-consuming (and eye-wearying) process and more volunteers are needed for a more exhaustive analysis of this data. Brewer’s Blackbirds are the most common bird species sighted on the roof (no surprise! 735 have been counted). Other commonly sighted birds are Common Raven, Rock Pigeon, European Starling, Red-winged Blackbird and American Crow. Uncommon birds sighted include Red-masked Parrots, Townsends Warbler, Pelagic Cormorant, Great Egret, American Pipit and Allen’s Hummingbird. Most exciting was when a newly fledged Red-tailed Hawk landed on the roof from a nest in a nearby tree and the hawks foraged there until the young were able to leave. Also, a pair of Black Eyed Juncos nested successfully on the roof (the first birds to actually make it their home!). So, that’s the latest report on the living roof. Stay tuned for future updates! This entry was posted in california academy of sciences, people, plants, urban ecology, wildlife and tagged golden gate park, urban parks, urban wildlife, wildlife photography. Bookmark the permalink. We had the pleasure of meeting the fellow who designed the living roof for the Academy and many other locations around the world. He wouldn’t be surprised by this monitoring report. He advised the Academy to walk around the city and identify the plants that grew in the cracks in the sidewalk. These were the plants he advised the Academy to plant on the roof because these are the plants that are adapted to the current conditions in the city. Of course, they refused because they were committed to planting exclusively native plants and, obviously, most plants found growing in the sidewalks are not. He also advised the Academy not to irrigate the roof, because the point of the roof is that it should be sustainable without using scarce resources. Again, they refused, because they knew that if the roof weren’t watered most of the native plants would be brown during the dry season. They prefer the public to believe that native plants are beautiful year around. 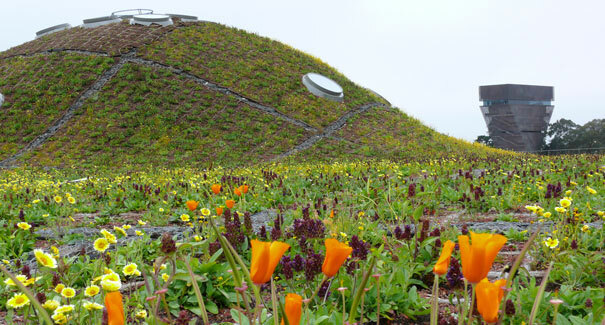 The living roof is not natural because it is irrigated and intensively gardened, yet non-natives still populate it. There is a lesson here for anyone who is willing to learn from it.